Reverend Jesse Jackson Visits Burlington Children's Space (27 mins) and speaks at UVM (1:10). 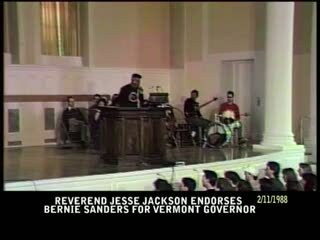 The appearance is partly for Jackson to endorse Bernie Sanders for Governor. Jackson goes around playing with kids, climbing a tower. Bernie and Jesse talk with reporters. Want to see more vintage Bernie? Order a copy of our "Positively Bernie" DVD today! Bernie Sanders. Jane Driscoll. David Driscoll. Mark Johnson. George Thabault. Will Mikel. JY Wilson. Andy Potter. Andy Goodrich. Judy Simpson. At Ira Allen Chapel: Liz Blum. Ledbetter. Gil McCann. Man rapper and music. Ellen David Friedman. Will Miller. Kiss. Crowd through the windows.